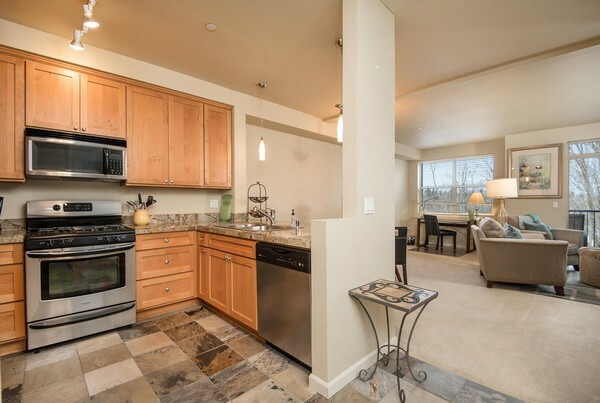 Newcastle/Bellevue - 1 Bedroom and 1 Den, 1.5 Bath Condo short term rental. 30 day stay minimum. Rent pro-rated daily thereafter. Great location. Just a few blocks from grocery stores, coffee shops, restaurants and multiple services. 3 Miles to Factoria/Bellevue. 6 Miles to downtown Bellevue. Secure building and garage with elevator access. All linens and housewares provided. Fully furnished and appointed. Just bring your suitcase! Absolutely everything was provided. I can't believe you even had the baking pans for my homemade muffins!